Brian A. Newman died Jan. 14, 2019 surrounded by family after a hard fight with cancer. He was 56. Brian was born July 16, 1962, the son of Everett and Barbara (Stauner) Newman. He graduated from Amery High school and later joined the Army Reserve. On June 25, 1994, Brian married Ronda Langness. Brian and Ronda have two sons, Casey and Alexander. 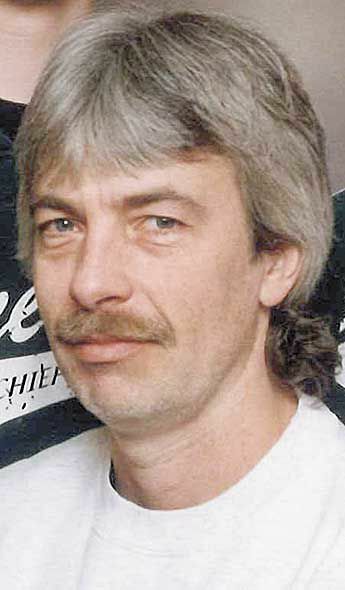 Brian worked mostly in the plastics industry, working for SMC in Amery as a mold technician for several years. Brian was a loving and dedicated husband and father. He found most of his joy spending time with his wife, kids, and grandson. Some of Brian’s hobbies were snowmobiling, watching sports, and playing fantasy football with his friends and family. In the summers you could find Brian grilling with his family, playing catch in the backyard and fishing with his sons and brothers. Brian loved music and started collecting vinyl records when he was 14. He enjoyed record shopping with his Uncle Galen and friend Ron B. Brian helped build a race car that he and his cousin Jim raced at the Centuria Speedway, which made for some memorable summers he was particularly fond of. Brian will be greatly missed by many. Left to mourn his passing are his wife, Ronda; sons Casey (Taylor) Newman and Alex (Rachel Wonderly) Newman; his pride and joy, grandson, Sutton Newman; mother, Barbara Rudd; stepfather, Richard Rudd; brothers, Craig (Carol) Newman and Troy Newman; step-sister Ann (Dale) Clarkson; step-brothers, Michael Rudd and Tom Rudd; many aunts, uncles, nieces, nephews, cousins, and friends. Brian is preceded in death by his father, Everett Newman; grandparents and nephew Garrett Hanson. A celebration of life was held Jan. 22 at the Grandstrand Funeral Home in Osceola. Arrangements are with the Grandstrand Funeral Home. Condolences may be expressed online at www.grandstrandfh.com.